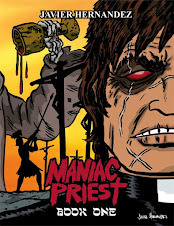 My artwork is being used for the cover on a new book by Frederick Aldama. Aldama is an Arts and Humanities Distinguished Professor of English at the Ohio State University. Among his fields of expertise are Latino/Latin American film, literature and comics. 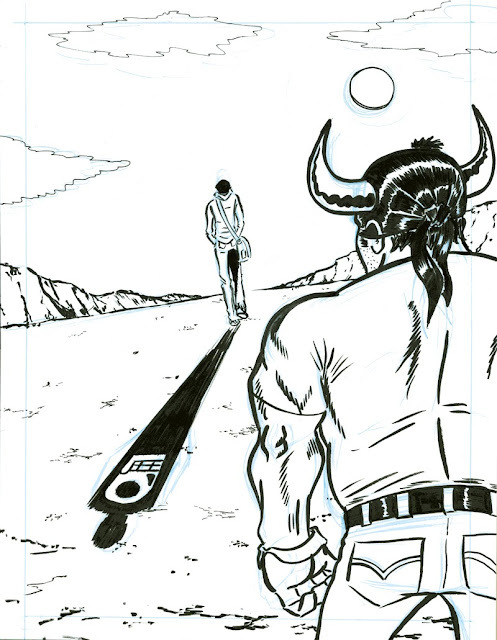 He's authored and edited 14 books, including the landmark study YOUR BRAIN ON LATINO COMICS. 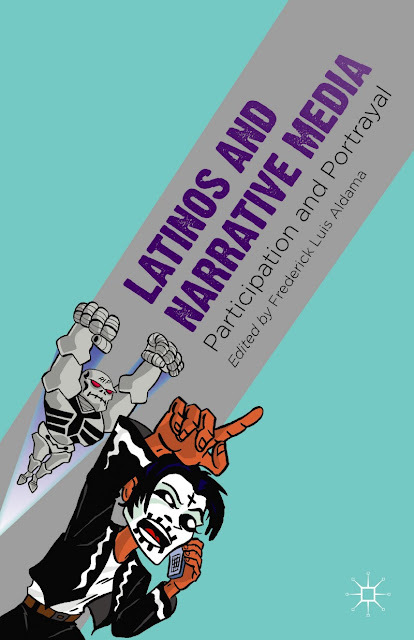 His new book, LATINOS AND NARRATIVE MEDIA, features essays by leading scholars on Latino pop culture and includes writings on filmmaker Robert Rodriguez, the animated series "El Tigre" and the film "Nacho Libre". 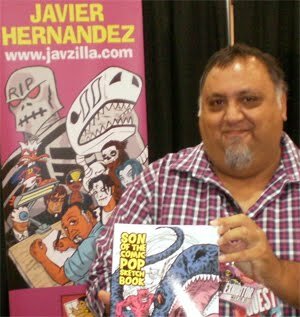 There's actually a chapter on me titled " Javier Hernandez's El Muerto as an Allegory of Chicano Identity" written by David Allen Foster. That was a complete surprise to me, too! I hope some of you read this book, because I'd love to hear what you thought about it. I was also asked to write the Foreword to the book, which was itself an honor. The cover illustration originally appeared as the cover the MANGA MUERTO Vol 1. The graphic design department did a nice job of incorporating the text into the composition of the artwork. LATINOS AND NARRATIVE MEDIA, published by Palgrave Macmillan, is scheduled to be released on November 7. You can read details about the book here. 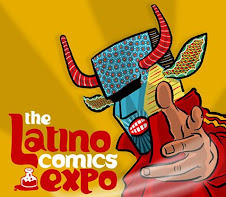 Frederick Aldama will be appearing at the Latino Comics Expo LA on August 17, at the Museum of Latin American Art in Long Beach, CA. He'll be conducting a presentation called "Spandexed Latinos: Geometric Storytelling in Superhero Comics" at 1pm. I'm currently taking Pre-Orders for my new book, the LOS COMEX CODEX! 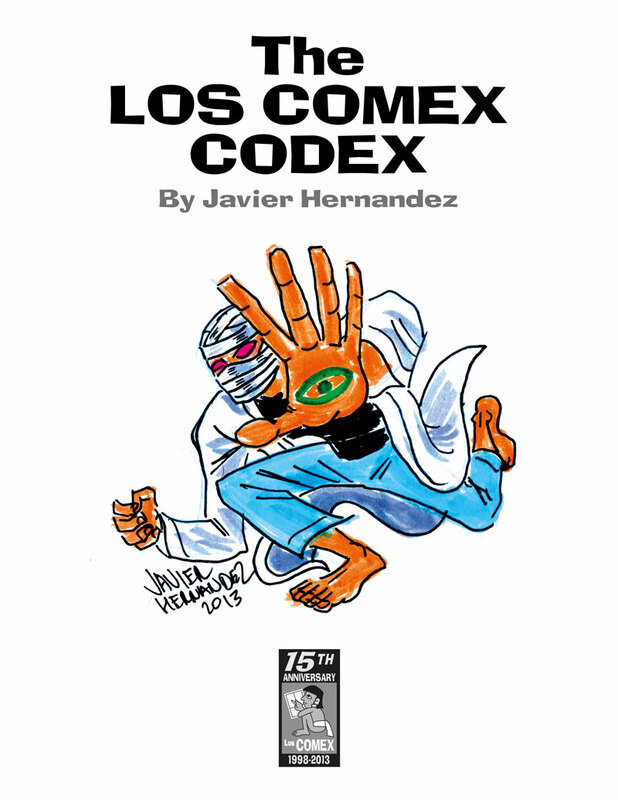 The CODEX is a 138 page collection of 5 of my out-of-print comics. 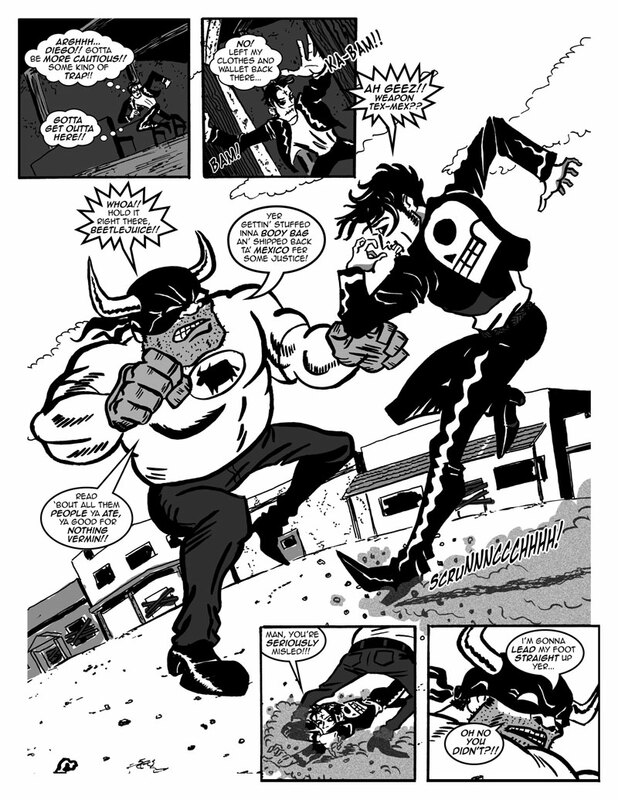 Measuring 8.5" x 11", this hefty volume reprints Weapon Tex-Mex vs El Muerto, The Coma, Man-Swamp, Dead Dinosaurio and "A Day at the Beach" from MANGA MUERTO Vol 1. The covers are in color, the interior pages are b&w (some stories are toned in gray, one is drawn entirely in pencil). 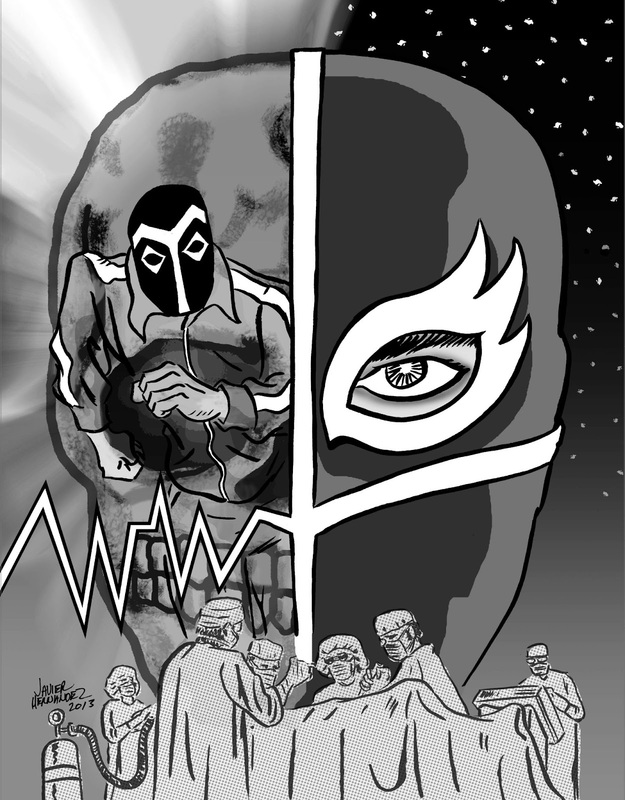 The book will debut at the upcoming LATINO COMICS EXPO LA, being held August 17 & 18 at the Musuem of Latin American Art in Long Beach, CA. The drawings will be signed, and if you'd like, I can personalize it to you or someone else if you're in a gift-giving mood! Pre-Order price is $20.00, which includes Priority Mail via USPS. Visit my Webshop to place your order. 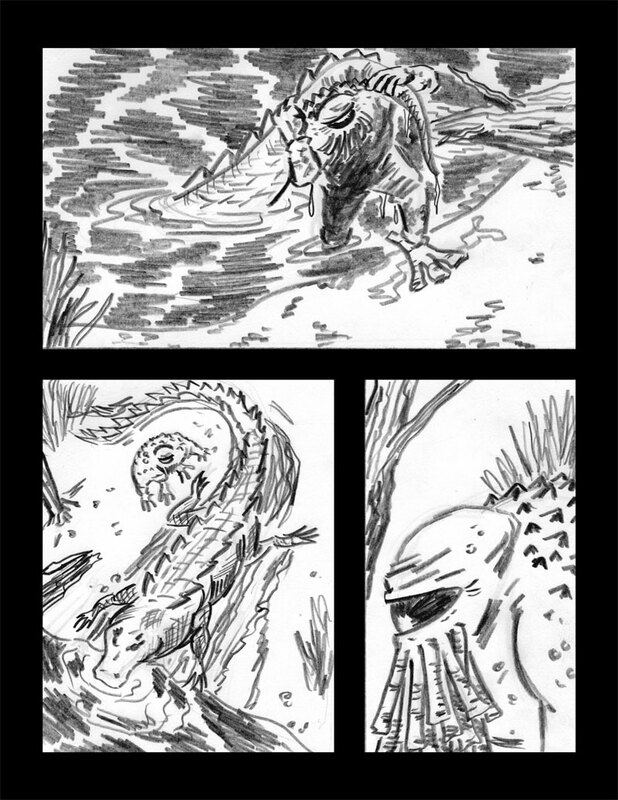 I also put together some Archive Editions, featuring a page of original comic book art. 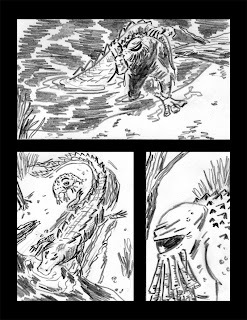 The pages are the actual ones I drew to create the original comic books. Most of these are 8.5"x11", but the Weapon Tex-Mex/El Muerto page is 11"x14" and the cover artwork to the COMEX CODEX is 11"x17". Check out my Pre-Order section over at my Los Comex Webshop for prices and the complete selection of Archive Editions. By the way, the reason I don't have any Dead Dinosaurio pages available is that most of the pages sold when I had that comic on Pre-Order last year. And the Manga Muerto pages? Well, that one's tougher to explain. A few years ago, I had my car stolen, and inside were the original pages to this particular story. I was sharing them with my students at one of my comic book classes the day before, and unfortunately didn't remove them from the car the following day. At least I had already scanned the pages! Pre-Orders help me to get the book printed, so I appreciate anyone who buys a copy. All orders will begin shipping by August 22, so everyone who bought a copy will get them by the end of August. It's possible I might start shipping a few days earlier, I'll notify folks via email once the books are mailed off. 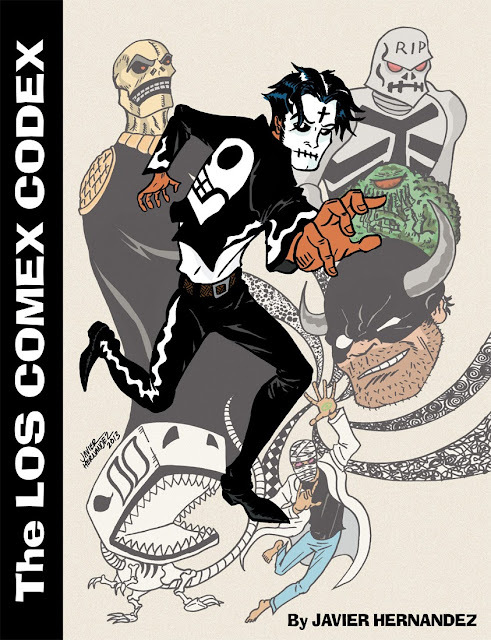 Pre-Orders for the LOS COMEX CODEX will end on Wednesday, July 31. Order through the Los Comex Webshop. 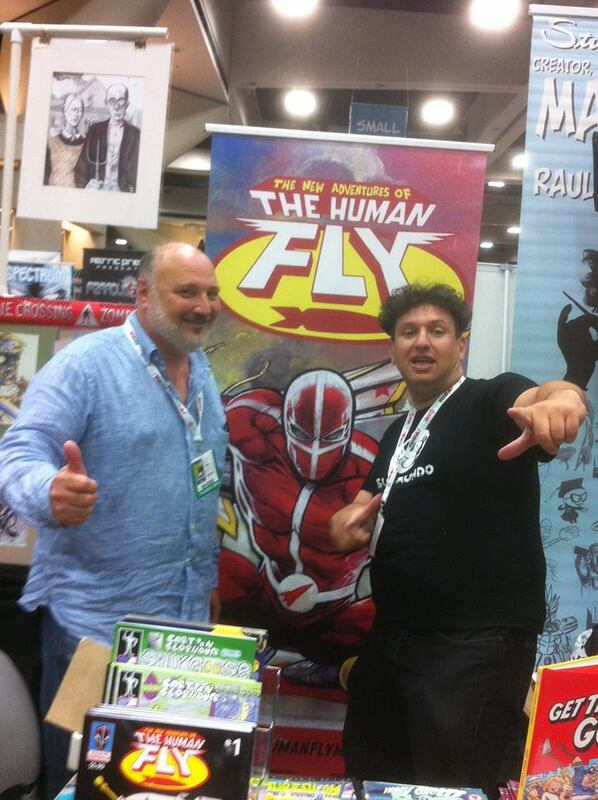 The Human Fly is back in comics! 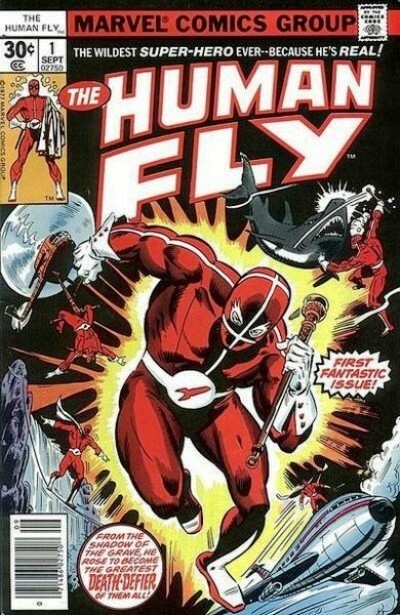 Readers of my blog will recall the various posts I've written previously about the Fly, the real-life, costumed Canadian stuntman who appeared in his own comic book published by Marvel Comics from 1977-1979. The entire 19 issue series was written by Bill Mantlo, one of my favorites. 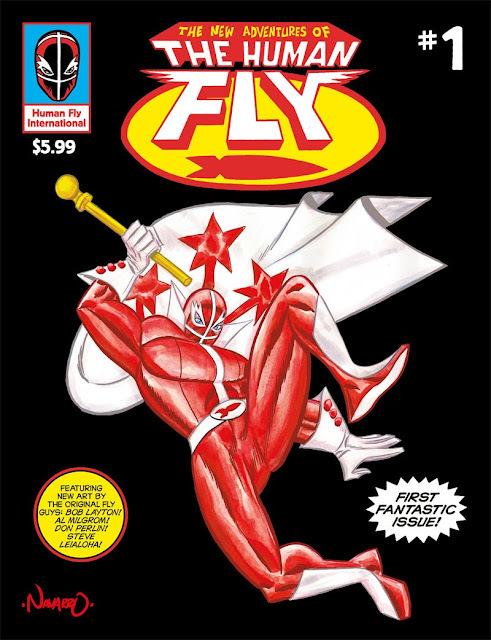 The rights to the character are now owned by Human Fly International Inc., comprised of a filmmaking trio who are making a movie based on the true-life story behind the Human Fly! Screenwriter Tony Babinski, director Steven Goldmann and producer Alan Brewer have commissioned a new series of Human Fly comics, and the first issue is debuting this weekend at San Diego Comic Con. Producer Alan Brewer (L) and Editor-in-Chief/cartoonist Michael Aushenker at San Deigo Comic Con. In addition to those veteran artists, there are stories and pinups illustrated by independent cartoonists such as Rafael Navarro (who illustrated the cover), Paul Mason, John Heebink, Jim Rugg and others. Michael wrote and drew one of the stories as well. And....I was able to contribute a pin-up myself! Originally, I was slated to illustrate one of the stories, but unfortunately, due to an extremely busy workload at the time, I had to withdraw. However, I was able to produce this image, which of course I was happy to do. While I wasn't able to commit to the deadline for drawing a story, my schedule eventually cleared up somewhat and I was able to work on the production of the actual book. 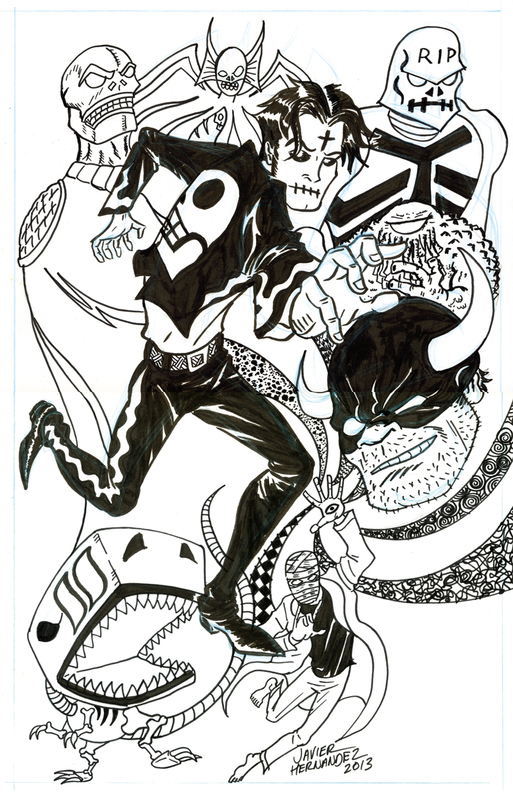 That meant getting all the pages the artists had produced and formatting it for the printer. I worked with Michael on designing the cover, as well as the overall layout of the book. The filmmakers collaborated as well, so the final book represents a team effort worthy of the Human Fly. A fan of the Fly from the first issue back in 1977, it was pretty exciting to work on the new book, some 36 years after the fact. Opening the files as Michael forwarded them to me, seeing new Fly artwork by some classic Marvel veteran artists, was surreal. And of course seeing the new stories as they were completed was fun, too. 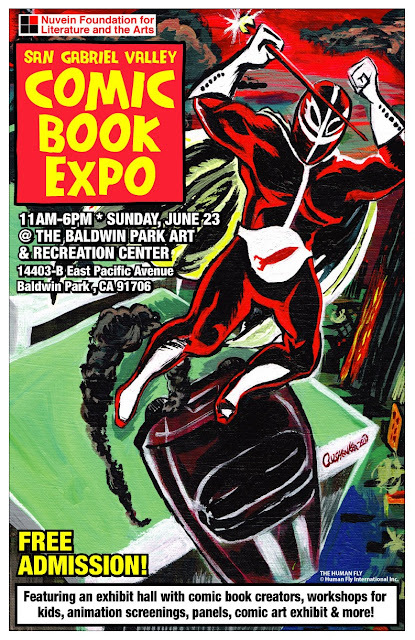 Earlier this year, I was working on the planning of the San Gabriel Valley Comic Book Expo (which was organized by the Nuvein Foundation), and I had the idea to bring the Fly into the mix. Michael had produced two new paintings of the Human Fly, and I asked him if he'd let me use one of the paintings for the official poster for the Comic Book Expo. He was delighted, so then I secured permission from the Human Fly International group and...Ta-Dah! Far as I know, it's the only time the Human Fly has ever been used on a comic book convention poster, so this was a cool stunt to pull off! I'll be joining the promotion of the book for an LA signing, so stay tuned to my blog for info on that. 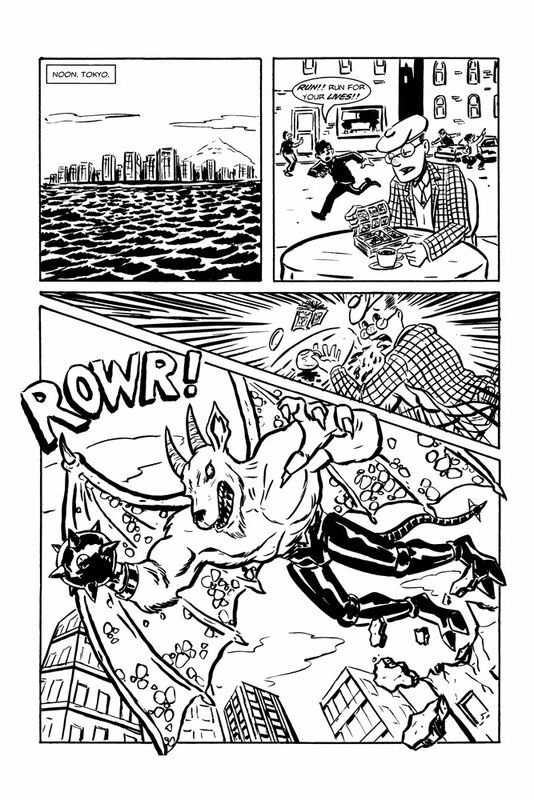 This being the opening weekend for Guillermo del Toro's new movie PACIFIC RIM, I thought I'd use the opportunity to put together a digital comic book to share with the world! 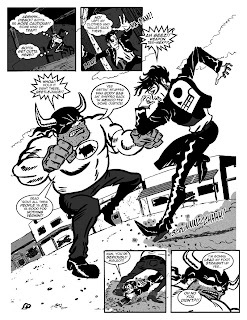 Spinning out of my comic book character El Muerto, in 2000 I created an alternate version of El Muerto I called MANGA MUERTO! These stories feature El Muerto as a foreign exchange student in Japan, teamed up with his own giant robot called SKELETRON. 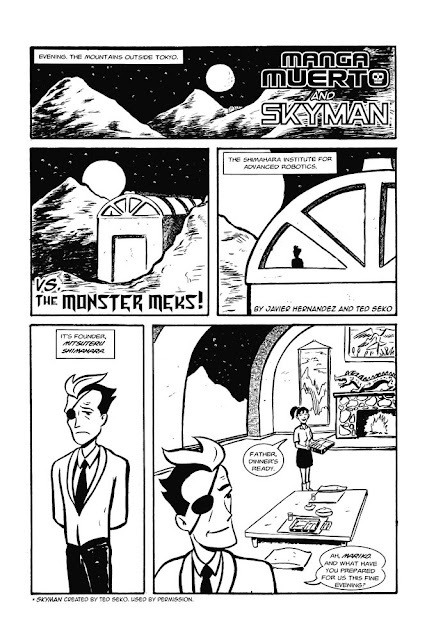 In 2001, I teamed up with friend and fellow cartoonist Ted Seko, as I wanted to include his character Skyman (since renamed Fusion Man) in a new story featuring giant robots and giant monsters (or specifically giant cyborg Monster Meks!). 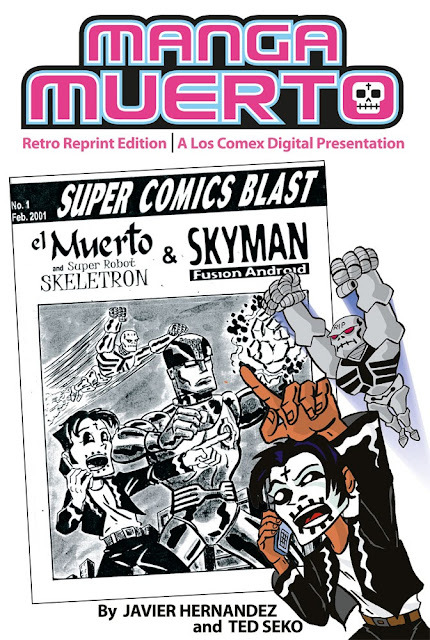 The book was printed as a mini-comic, then later published in the comic book MANGA MUERTO Vol 1. Since that book is now out-of-print, I thought I'd share the Skyman/Muerto story with everyone online....for free! The original b&w mini-comic featured a back cover by illustrator Mark Jiro Okui (creator of cult zine CALLING MONSTER ISLAND). For this new digital edition, I've once again put it on the back cover, but this time I colored it. One of my favorite places to visit on Facebook is the DITKOMANIA Group. 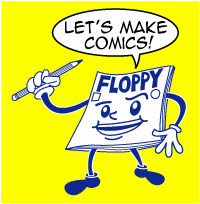 It's run by Rob Imes, the Editor-in-Chief and Publisher of DITKOMANIA, the zine dedicated to the work of comics great Steve Ditko. 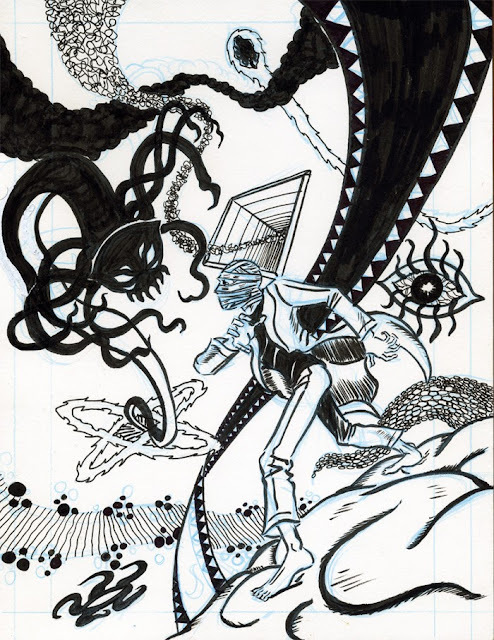 The DM Facebook Group is fairly active, with members posting some of their favorite Ditko images as well as engaging in numerous discussions on the work of cartoonist Steve Ditko (Spider-Man, The Question, Mr. A). Ditko's comic career started in 1953, which makes him a 60 year veteran of the industry. He is, in fact, still producing new work today, usually averaging a new 32 page comic book every 4 or 5 months. I'll often post or comment there myself, and in fact was going to share these images there. But I decided to post them here since I wanted to add some commentary. 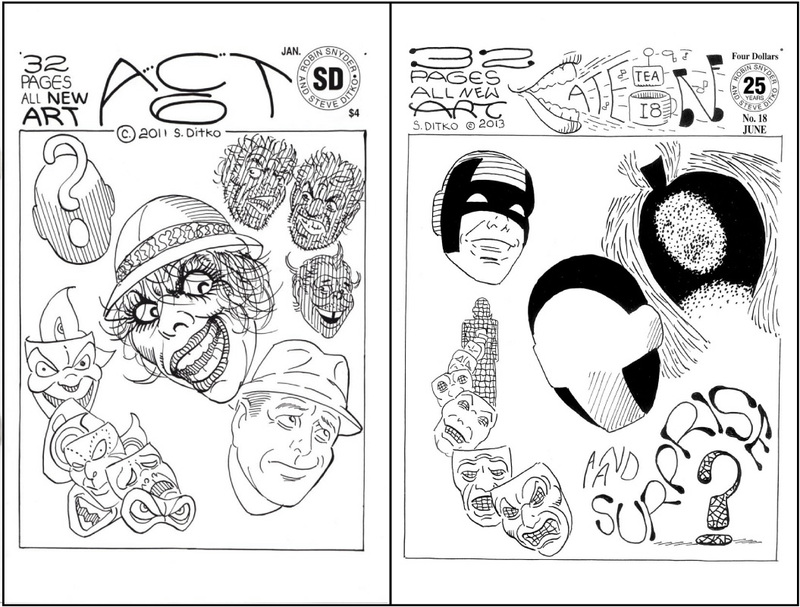 'Act 6', which is actually the 11th issue in the series, shares a similar design with #18: The cascading masks on the lower left corner and the character headshot in the center of the page, surrounded by images of the other stories in the book. These two issues were printed about 2 years apart, so I'd be curious if Ditko just fell back on this design choice or specifically recalled the original image when drawing the newer one. Also note the use of question marks in both images, a motif that Ditko had been using for decades. #13 and #14. These actually bookend one another nicely, with the design flipped from one book to another. 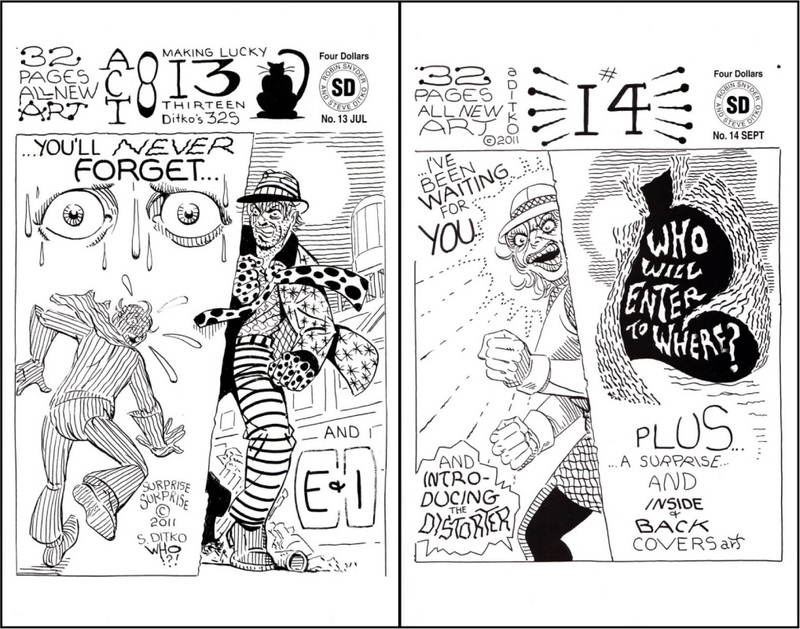 Another Ditko trademark shows up on issue #13, the wide-open eyes surrounded by sweat and tears. The intensity with which Ditko portrays these type of eyes is haunting, and always works. As you can tell by the above examples, Ditko seems to take great joy in his titles and numbering for these comics. The ingenuity and playfulness of the design, such as the motifs he uses (I love the black cat & 'lucky 13' wording), really endear these comics to me. Plus he really makes ample use of lettering, adding text and blurbs throughout the cover. Again, it seems very playful, as well as enticing the viewer to come aboard for an entertaining ride. He also seems to be fond of the word 'surprise'! It's interesting that the top row of characters are almost the same on both books: The Cape, The Outline and Hero (except on issue #17 Hero is substituted for The Distorter). The bottom characters change from The Madman to Miss Eerie. Note that both these characters are speaking, as well. Right before they pulverize some hapless criminal, no doubt! Miss Eerie, by the way, is one heck of a character. My favorite of Ditko's current era. She's a Private Investigator named May Ero, who dons a grotesque mask and solves crimes as the the two-fisted Miss Eerie! Everytime I see her on the cover of a new book, I look forward to her latest escapes. 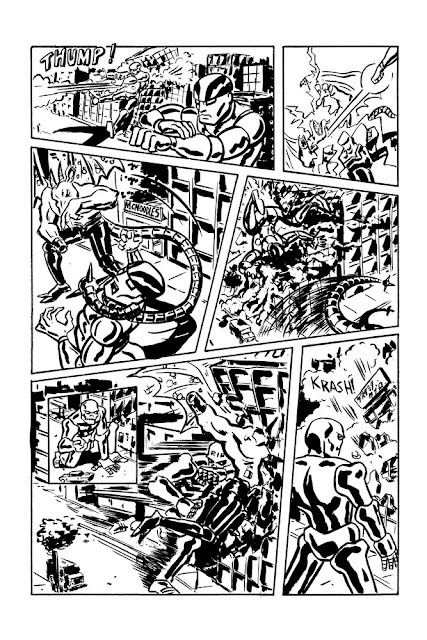 Even today, at age 85, Steve Ditko continues telling his stories, and bringing his signature creative design skills to the table. 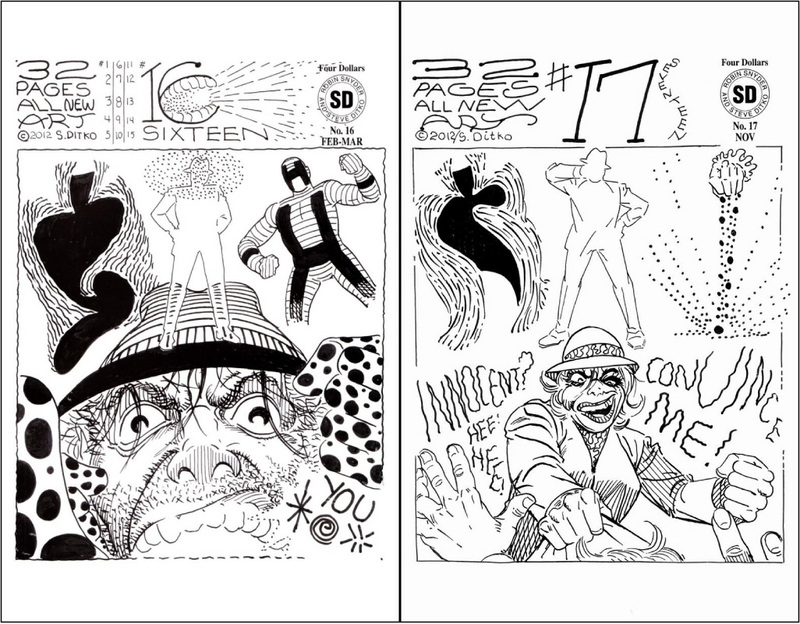 These comics, and many more, are available from Robin Snyder, Ditko's partner in publishing. I usually order direct from Snyder, as the books don't have wide distribution through comic shops (although there are stores that carry them). 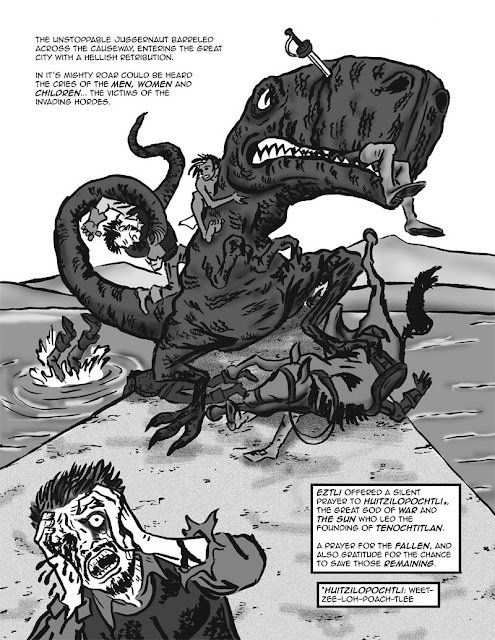 You can visit Bob Heer's site, DITKO COMICS WEBLOG, where he maintains a list of all current comics available from Snyder/Ditko, as well as ordering info and prices. So, if you're a fan of Ditko and want to support his efforts, visit that link and buy some of these comics!